I’ve been longing to slow down whilst out on the streets for some time, achieving a keener eye, holding back from pressing the shutter button to often with no aim. I’m already a ruthless culler of images with little regard for the shots I take that say nothing to me, and there are many! So I’ve decided to take a shift to shooting more film. Don’t get me wrong, I love my Fuji XPro1 and I’ll continue to shoot digitally…I love the ease and immediacy of this process, but I’ve longed to experience the ways of the past, the ways of the ‘real’ photographers of years gone by. I bought a Yashica Electro35 not long ago, a classic rangefinder style, and I love it, there can be no indecision when shooting film, no wasting shots. I found myself walking more without even lifting the camera to my eye. I also found myself waiting more for scenes to emerge from the hustle and bustle of the streets. But there’s something else, I’m somewhat of a purist at heart, I’ll happily rant and rave about prime lenses for the street, rangefinder style cameras, the very things the medium was built on, so what to do? 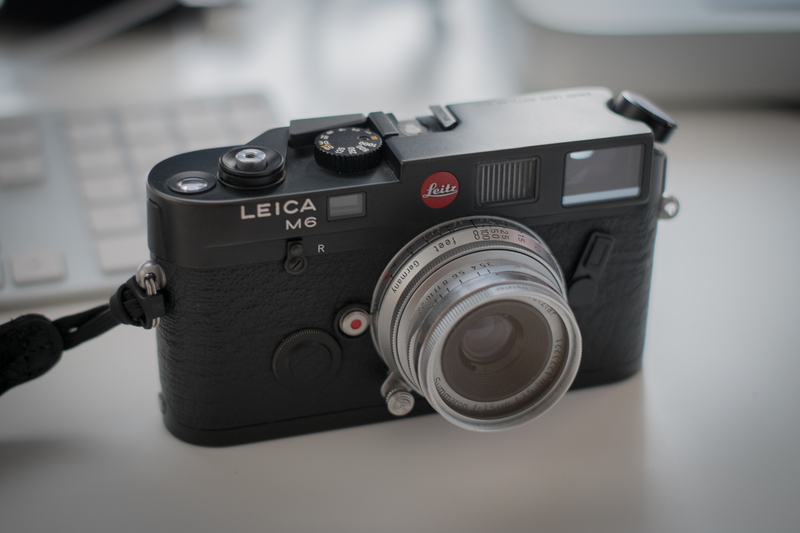 Buy a Leica M6 of course! I can’t wait to get out with it (I have been a little) there’s no doubt it’s a very nice way to see the world and hopefully when the film gets developed, I’ll realise what all the fuss is about! I look forward to this journey, and I hope you will too. Oh, this is going to be good. Looking forward to hearing how you get on Steve. Cheers John, yeah really looking forward to a film future! And you MUST develop and print your own work too. Even if you have to borrow a dark room. If you haven’t tried it already you will find there is nothing like the magical moment when the print comes out of the liquid. And, of course there is no finer way to learn to print digital than to work by hand first. Somehow, with digital, even if that’s scanning a negative, there is always the feeling you haven’t really printed it yourself. Especially if you use any of the formats provided by Silver effects Pro or similar. Good luck and much patience to you. Aaah now you come to mention it…I’ve just started the hunt for the darkroom kit! I think a developing bag will be the way to go as i don’t really have the space to have a proper darkroom. So just the developing side for now! BTW the process is VERY temperature sensitive so get a good thermometer. I used the sink filled with the right temperature water as a thermal bath for the tank. All possible in the kitchen. BTW2 I used to buy bulk film and use a film winder to load my own film. Much cheaper – if you can still get bulk film of course. And there’s a use for that changing bag again. Very, Very useful and don’t skimp on the quality. A light leaking cheap changing bag will soon cost you time and money in screwed up, fogged film. I’ll stop now as I’ll wibble on forever. Go with stainless steel reels and tanks. Patersons require more chemistry and I found no matter how hard I “rapped” them, I still got air bubbles. Use an expired roll of film and practice in the light. In no time you’ll be a master of loading film onto stainless steel teels! Stainless reels and tanks are easier to keep clean as well. Aaah i haven’t even ever seen Stainless steel tanks and reels!! Keith can you explain why patter sons ‘need more chemistry’? Hey Keith, I’ll check out the stainless steel reels etc. Could you explain why the Pattersons stuff ‘needs more chemistry’? The plastic tanks and reels are slightly larger. The tank takes roughly about 1/2 – 1 oz. more chemistry. Nice one Steve. I find film an exciting medium and I look forward to your results. I’m more than a bit nostalgic of this process. Perhaps I’ll get out a film camera again.